Chevron Infinity Scarf Only $4.99! You are here: Home / Great Deals / Chevron Infinity Scarf Only $4.99! Always step out in style with this hot accessory! 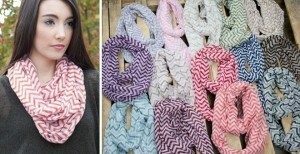 Chevron Infinity Scarf Only $4.99! With 16 colors to choose from you are sure to find one or two to suit your summer wardrobe tastes! Grab a few for yourself and a few for your friends as gifts this year! Grab this and other hot fashion deals on Jane every day!